I've been sitting on Dad's '88 Comanche for a couple of years. 6 cylinder. Original condition; 80k miles, "US Olympic" driver's side window sticker. I run it regularly, but dad barely put any miles on it for the last ten years and had to replace the rear main seal from sitting idle so much. Only thing that doesn't work is the radio. I'm thinking of putting it up for sale. Whats' the market like? Suggestions? Sounds like you got a nice one. Where you live can have a big influence on what the market is like. Hard to say what the value is with so few details. Pics help too. Is it 2wd/4wd, manual or auto ... etc. Could be a good one! Do they use salt on the roads in Idaho? The condition of the floors, rocker panels, cab corners, and the rear quarters above the flares makes a YUUUGE difference in value. Take pictures of the underside and the frame, look for rust there too. Peel back the carpet and inspect the floor panels for rust. One of my MJs came from a beach town and much of the underside was rusted through. Like in Oregon, I don't think they salt the roads in Idaho (I still have family in Coeur d'Alene) and the Jeep and Comanche market is pretty solid up there. lived in Boise from 1980 to 1987 --- back then they sanded, rather than salted and you could stud your off road tires. It's worth what someone is willing pay you for it. Non-AC truck............so, that hurts value. $8K.....?..........eh...........you'll be waiting a long time. I mean, it's worth whatever a buyer is willing to pay, right? you can ask 20k, but it doesn't mean there's a buyer for it at that price. 8k is definitely the higher end of price. The condition certainly seems pretty good, but keep in mind your truck has the less desirable peugeot trans, no AC, and is a pioneer trim rather than top-o-the-line. to get 8k, you might have to actually pull back the carpet and snap pics of pristine floor boards. Moisture under the carpet is insanely common for these trucks and that rot is horrible to have to deal with. Paperwork and other documentation can help a lot in attracting the high end buyers, so flaunt what ya got. It's certainly not legal, but it is possible to fake the mileage in the old trucks. Oh, and the build sheet is sometimes found tucked under the bench seat or behind the drivers door panel. but yes, you need to post elsewhere in the forums a few more times before the classifieds opens up. Very nice truck, I agree with what others have said regarding the price. Evidence of the truck being maintained is sure there, it’s easy to see looking at the items that have been replaced under the hood. Lots of folks will surely be after this one when you choose to list it, it is clean and untouched. People know the price point on these and it seems that more of the better “survivors” in similar condition as yours are getting listed by folks who inherited them, I feel they are popping up often these days. Only sell to a cash buyer, when it comes to something this old and sought after there is no reason to mess around with folks wanting to deal in another method. Good luck with a clean sale, be sure to tell the buyer about Comanche Club! The floors in these will rot just sitting in a garage all it's life. Hopefully they aren't bad but I'd expect to see at least a little surface rust. The Peugeot trans was a very light duty trans and is well known as being a problem waiting to happen. Some run 200k+ miles just fine, most don't. If yours still shifts smooth and sounds good in all gears, it won't be a huge problem with the sale. Now there is a possibility the trans was swapped for a desirable AX-15 at some point but with it being in your family so long, I'd imagine you would have heard about that. No AC does potentially bring the value down some but I wouldn't expect someone to pass up a clean truck just because it doesn't have AC. I don't have AC in any of my trucks, that's what the windows are for. It's a nice looking truck and you shouldn't have trouble selling it, list it for what you feel it's worth to you and be open to offers. $8k is probably a bit on the high side but I wouldn't take less than $4500-$5k for it. Keep in mind a clean truck in the salt belt will go for more. Especially if the market is rather thin in your area. 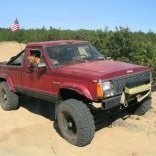 Hop on Craigslist and see what is available for Comanche MJs and Cherokee XJs to get a better idea. MJs are worth a bit more but seeing what XJs are priced at can help give you an idea. The further south the OP lives, the bigger a deal this is. I for one would never consider a non-AC truck at any price. It may not be working, but the infrastructure for it damn well better be there. I can fix a non-working AC system, but I really, really don't feel like adding AC to a truck that never had it in the first place. I'll pile on. First, it's a true survivor and you're fortunate to have it (albeit sorrowing how you got it). I would also echo Minuit in that, I would never buy an non-AC vehicle. I live in the northeast where it's only really necessary three months out of the year. Still, it's essential. You can ask whatever you want, but plan to keep it for a while at $8K. However, there's an a$$ for every seat, so who knows? I'm sure you could get $5000-5500 fairly quickly and if it were mine, I wouldn't take less. I just bought this truck! I'm so excited, no rust (as OP said). Records from day 1 including original bill of sale. I couldnt be happier. Also, first post. Just dying to know.........what did you pay for it?